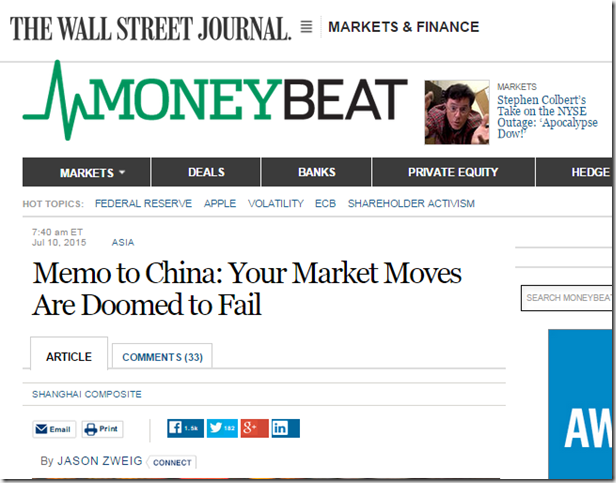 “Memo to China: Your Market Moves Are Doomed to Fail”. I’m struck by this not because I have a strong view on whether such measures might or might not work. (TARP and QE were also unconventional measures, and whether they worked or will work everywhere remains contentious.) Instead, it’s that I’ve just been in discussion about whether responsible Western media would use developments such as recently occurring in China’s stockmarkets to pronounce on the viability of the entire Chinese state. Now and then it is pointed out to me that such reports are heinous state-vs-state propaganda, pumped out by the Chinese, and that the free Western press would never see these in its responsible media. The first headline, however, suggests yes, even the Wall Street Journal does it; the second suggests greater precision on what the writer really wanted to say. Was the Wall Street Journal only trying to spice things up?